Guaraná Antarctica, the second best-selling soft drink brand in Brazil (second only to Coca-Cola) wants to save the newly heartbroken from a moment of weakness. With tongue planted firmly in cheek and a focus on it’s young male target audience, Guaraná Antarctica and it’s ad agency have come up with the Ex-Lover Blocker mobile app. The app seeks to help friends protect their heartbroken friend from calling the ‘ex’. The user starts by blocking the contact number of the ‘ex’ (in the case of this demo her name is ‘Maria’), then selecting the contact information of close friends to help keep an eye on him. Then when he tries to call the ‘ex’, the app alerts his friends instead. If he declines their support and continues on with the fateful call, a message is posted on his Facebook wall highlighting his moment of weakness. Yes, of course the app juvenile and when you think about it, Maria is probably way better off without this knucklehead and his buddies anyway. 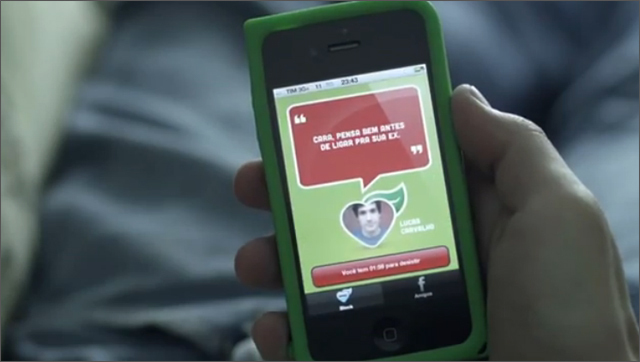 The ex-Lover Blocker was created by DDB Brazil, and can be downloaded free from the Apple App store.